Looking for the best exposed aggregate, liquid limestone and decorative concrete in Perth? 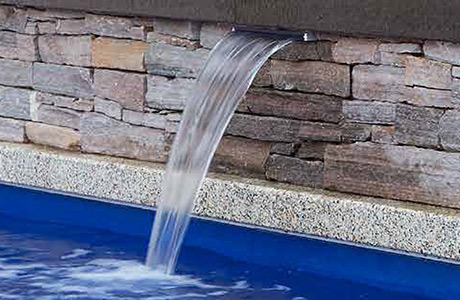 The best Service for Pool edgings. Having a beautiful, low maintenance pool surround is the dream of many pool owners, and at Decorative Concrete WA, we can turn the dream into reality. Many people with pools do not realize how much of a difference a solid, quality pool deck, edging, or surround will make in regard to the amount of use and enjoyment their pool will provide. After all, battling with cracks, weeds, and crumbling deck areas takes the fun out of owning a pool. When we arrive to give you a free design consultation and an estimate, we will examine your pool area, checking for problems or potential hazards. Our designer will spend a majority of their time listening to you; finding out what products and services of Decorative Concrete WA will best suit your needs, your style, and your budget. Using decorative concrete around your pool area is a durable, low maintenance, and beautiful way to achieve incredible results at a fraction of the cost for other frequently used, and costlier, materials. Our talented concrete artisans can replicate favorite high-end products such as wood, stone, or slate at a fraction of the cost. 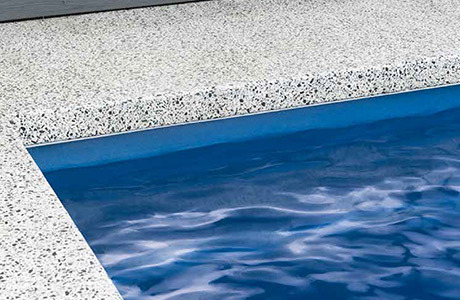 Additionally, we can give your pool a customized look by adding Glowcrete bits into the material we use. Pool edging, also called pool coping, is an important step to give your pool a finished look. At Decorative Concrete WA, we find that poured concrete is a wonderful way to maintain a clean, uninterrupted line blending the deck or surround right to the pool. Matching the kinds of concrete used in the surround and the edging unifies the entire area making a seamless transition. If you would prefer a unique look, consider using a complementary colored concrete to make the edging stand out. This look can be achieved with various colors of the same material or by mixing types of decorative concrete, such as having a stamped concrete pool surround and an exposed aggregate edging. Contact us by filling out the contact form below or calling us on (08) 6244 4241. Want a quality and affordable exposed aggregate driveway in Perth? We can make your pool deck or surround from several different kinds of decorative concrete. Using a stamper allows us to add nearly limitless kinds of patterns and textures into a concrete pool deck. Beautiful geometric patterns, brick or tile designs, and even wood grains will instantly upgrade the look of the concrete surrounding your pool. By adding powdered pigments to a concrete mixture, we can create stunning effects around your pool. While we can create a rainbow of colors in concrete, we suggest that our customers choose white and light colors because they will reflect the sun’s heat rather than absorbing it. Mixing and exposing an aggregate in the concrete around a pool looks tremendously elegant and cutting edge. This technique is deceptively simple, and it will not destroy your budget. Exposed aggregate is a versatile and customizable method to create a unique look that is comfortable for walking. Steps are sometimes an overlooked part of your home or business. They usually receive attention when they begin to fall into a state of disrepair. At Decorative Concrete WA, we can turn ordinary stairs into fabulous focal points of your home or work place. Replacing steps is a straightforward process which typically takes a few days, including drying and curing time. We can create concrete steps to coordinate with or accent nearly any architectural style. Also, we can create your stairs using any type of our decorative concrete products. Regardless of the type of concrete product we use, we will be sure to make your new stairs safe and skid resistant, as well as beautiful and durable. Our design consultants will assist you in creating the perfect steps for you. Additionally, you can count on us to install safe and sturdy hand railings. Aside from being a safety feature, stair rails are typically an essential addition to meet building codes. We can use any of a wide variety of materials including concrete, wrought iron, or wood. It’s a beautiful, cost effective material that will last for decades while needing only minor maintenance. Here at Decorative Concrete WA, we are committed to our customers and to our community. Being in the same location for decades and watching the community grow and change is a privilege. Being welcomed into our customer’s homes and trusted with their projects is also a privilege, and we do not take that opportunity for granted. We are proud of our community and our involvement over the years and look forward to continued participation in the future. © 2019 decorativeconcretewa.com.au | All rights reserved.